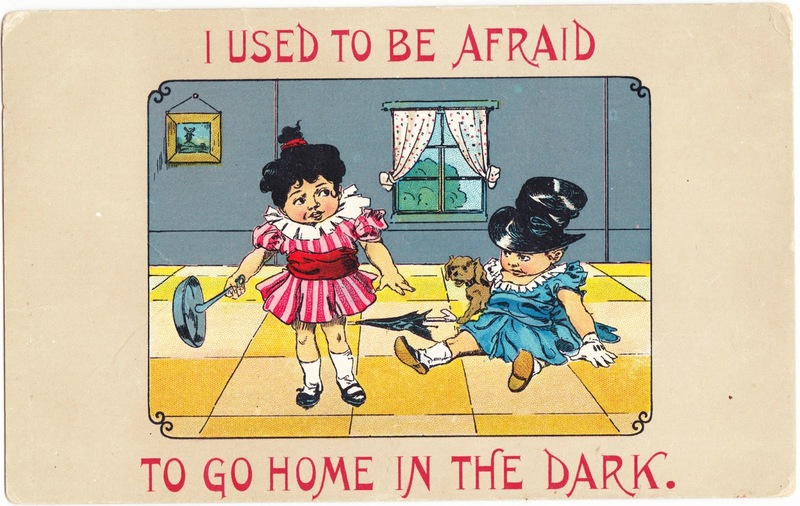 Papergreat: Illustrated postcard: "I used to be afraid to go home in the dark"
Illustrated postcard: "I used to be afraid to go home in the dark"
This vintage postcard has an amusing, and perhaps slightly disturbing, illustration on the front that features a pair of toddlers, a frying pan, an umbrella and a puppy. I take that back. It's not at all amusing. What the hell is going on here? There's no date anywhere on the postcard. The publisher initials are SB (which might be Samson Brothers), and the card was printed in America. Also, and perhaps this unrelated, but there is a circa 1908 song titled "I Used to be Afraid to go Home in the Dark." It was written by Egbert Van Alstyne. How are you. Why dont any of you folks write. I wish I was down there with you But like it fine out here. Well come out and see us lonesome people in Ohio. In Mildred's defense, these locations were more than 300 miles apart, so you can see where a visit might not have been the easiest thing to do more than 100 years ago.